Squee! 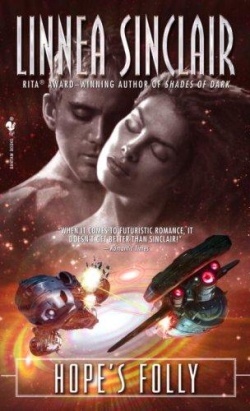 The RT Book Reviews blog has coverage of Linnea Sinclair's Intergalactic Bar & Grille party, which she throws at the annual RT Booklover's Convention (happening now in Chicago): RT Booklover's Convention 2012: A Day of Sci-Fi Romance. At the end of the workshop, the audience asked the panelists some great questions including one attendee who wanted to know what the panelists thought the hardest part of writing sci fi romance is. Many of the authors including Aguirre and Pape agreed that deciding which genre to focus on, sci fi or romance, is difficult. In order to sell books, they pointed out that many sci fi romances are either futuristic romances with more of an emphasis on the relationship, or science fiction stories with a slight romance edge, but with more description of science and technology. What the above passage says to me is that authors are experimenting with a wide range of SF-romance blends and frankly, that benefits readers. The choices exist if you know where to look. What I think will help SFR evolve further is not just the types of stories or the specific blend of elements, but social networking and innovative marketing. One of SFR's greatest challenges is not lack of stories, but obscurity*. If anyone has other sci-fi related news from the convention, please do share it with us in the comment section!